We got bogged down in our bathtub project for a few different reasons. 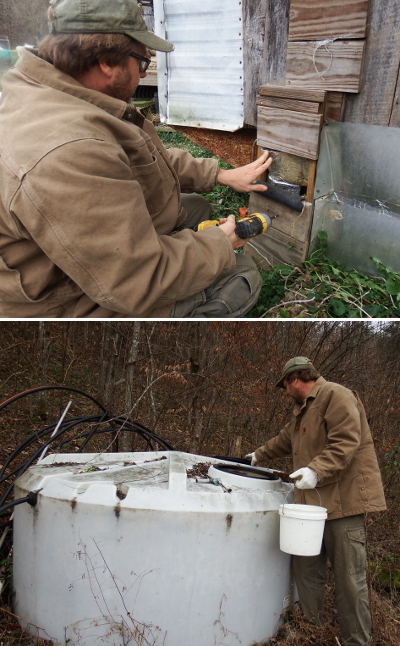 First, the weather turned cold, so we had more staying-alive issues to deal with (firewood, frozen water). Second, home renovation doesn't involve living things, so I don't tend to prioritize it (lazy garden-obsessed homesteader!). And, finally, we had so many interesting comments on my planning post that I needed to digest for a while. Speaking of dragging our heels, I guess I should give you at least the cliff notes version of why we don't currently have a working bathtub. One came with the trailer, of course, but when you start from scratch with untraditional home-plumbing, it simply makes more sense to concentrate all of the influent and effluent at a single location. In our case, the chosen location was the warmest spot in the winter trailer --- the kitchen, where we use water constantly for dishes, cooking, and washing. As a result, we ripped the entire bathroom out and turned that area into chicken-waterer-building central. So how have we been bathing for the last decade? In the summer, a hose outdoors is top notch (says Anna --- Mark prefers his water to be more temperate). In the winter, though, I go for water heated on the stove and poured into a galvanized washtub while Mark prefers bird baths. As you can tell, anything we build will be a major step up. Okay, now you're back up to date on the next building project. Time to start thinking of the newest bathing apparatus once again! Thought you might like to know about this battery-powered shower. It works brilliantly & the rechareable battery lasts forever. Your comment about heating water on the stove and then using a washtub to bathe reminded me of my grandmother's house in what is now the East Village of NYC. She lived in one of those buildings that used to be called a tenement on the top floor, if I remember correctly. They did the same thing: heated water on the stove and then poured it into a washtub to bathe. This was in the early 1950s. Flash forward to 1960 when I visited an aunt in Jersey City, NJ, across the river from NYC. I was there for a weekend and we did our bath the same way: heated water on the stove and then poured it into a washtub. So your solution to bathing is a time-honored one! 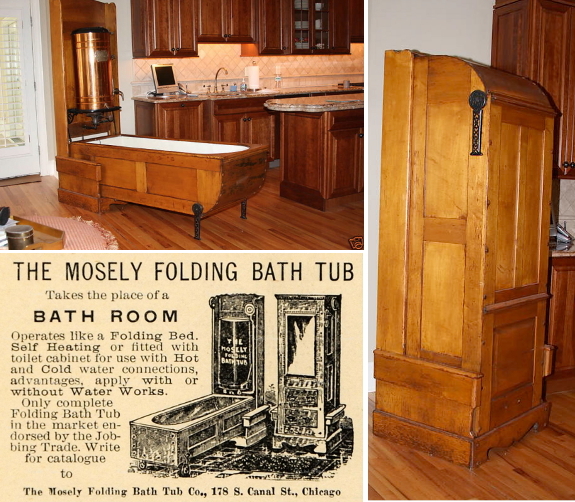 I like the picture of the folding tub. Did you notice that they had a hot water heater(?) reservoir right above the tub? Talk about using space efficiently! Since NYC has now given the green light to builders to make ultra small (400 square feet! which would be about a room about 20 feet by 20 feet) this sort of thing would be useful. I have seen some pics of potential "apartments" there that depict the bed folding up into the wall and table being attached to same to fold down so one can eat. I wonder if they got their ideas from Japan where space is very very tight?